Hi, friends! I am so happy that you’re here! I’m Leah: former teacher, current stay-at-home mom. This is where I share about using the Charlotte Mason philosophy in the early years (ages 0-6). Four years ago, when my daughter was a brand new baby, I left my job as a public school teacher to teach at an Ambleside School. I had to leave my little bundle of joy for an entire week as I was trained in the Charlotte Mason philosophy. What a challenge for a new mom! But that experience changed my family forever. I am so blessed that I learned this philosophy when our family was just starting out. My hope is to share Charlotte Mason with other families so that their parenting and relationships can be positively impacted as it was for our family. As I prepared to leave Ambleside School to stay home with my children two years after beginning my career there, I realized that there was very little information about using Charlotte Mason in the early years. 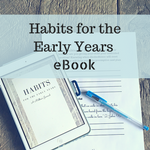 In fact, I couldn’t find an early years blog at all! The idea to start my own tugged at me for about a year, and then in May 2016, I finally took the plunge! It is clear that this is God’s plan for me during this season of life, and I am enjoying it so much. I want to share with you different topics and perspectives. I’m a busy mom, like you, and I don’t want to reinvent the wheel! One of my favorite things to dig into is how modern research aligns with Charlotte Mason’s philosophy. It constantly amazes me how relevant her ideas are more than a century later! If you’re new here, these links are a good place to start. I send out a newsletter each week with a quick note, and links to my posts from the week. New subscribers will receive access to the My Little Robins Subscriber Library, full of great resources to help you on your Charlotte Mason journey. Games that Preschoolers will Love!